By The Polling Observatory (Robert Ford, Will Jennings, Mark Pickup and Christopher Wlezien). The homepage of The Polling Observatory can be found here, and you can read more posts by The Polling Observatory here. This is the forty-fourth in a series of posts that report on the state of the parties as measured by opinion polls. By pooling together all the available polling evidence we can reduce the impact of the random variation each individual survey inevitably produces. Most of the short term advances and setbacks in party polling fortunes are nothing more than random noise; the underlying trends – in which we are interested and which best assess the parties’ standings – are relatively stable and little influenced by day-to-day events. If there can ever be a definitive assessment of the parties’ standings, this is it. Further details of the method we use to build our estimates of public opinion can be found here. Politics has returned with a vengeance after a brief festive cease-fire. All the parties have moved into campaign mode with just a few months left until election day, and news schedules are now daily filled with briefings, policy announcements, and the wearying trench warfare of spin, with hyperbolic claims and counter-claims hurled back and forth. What have the voters made of it all? Our last report tracked polling up to the beginning of December, so the latest estimates from the Polling Observatory cover two months: the December lull as well as the January campaigning. So far, there is little evidence of any decisive impact on the overall balance of power. Labour support has been stable for the past two months – our February 1st estimate of 32.2% is exactly the same as our estimate for December 1st. There has been a great deal written in the media about an alleged slump in Labour fortunes, but this story seems to be behind the curve of polling – Labour support did experience a substantial drop in the early autumn, but has been stable since. Given that much of the autumn fall in Labour support seems to be concentrated in Scotland, where the recent wave of constituency polls by Lord Ashcroft has confirmed a massive swing from Labour to the SNP, it is possible that overall support for Ed Miliband’s party has not declined at all in England and Wales in the past year. Conservative support has picked up a bit over the past two months, but most of the gain merely recovered the ground lost in November. We now have them at 31.2%, one point behind Labour, and still stuck in the 30 to 32% band where they been marooned for almost three years. The Conservatives will hope that their positive economic message, and David Cameron’s sizeable ratings advantage over Ed Miliband, will start to deliver polling gains as the election approaches, but as yet we see little sign of this. UKIP received less attention over the winter than they enjoyed during their vintage autumn, crowned by two by-election victories. This may explain the slight dip in their poll ratings, down 0.7 points to 15.5%. 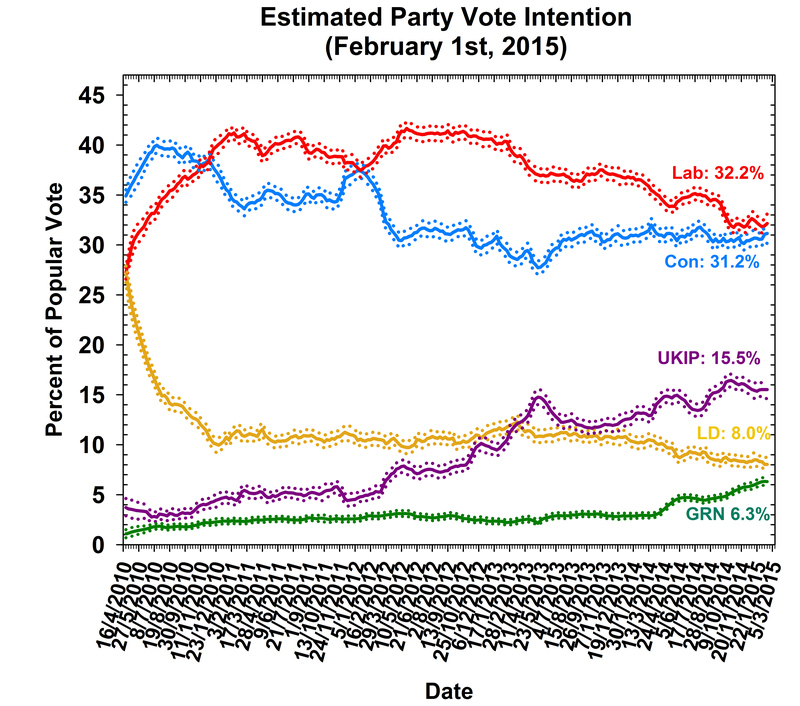 Both of the main parties will hope that Farage’s insurgents will be squeezed in a more sustained way as election day approaches, but there is no evidence of this yet – 15.5% remains above the highest ratings the party received before 2014. The Liberal Democrats slid once again over the past two months – down 0.5% to 8.0%, a record low on our revised methodology. The party’s famed constituency campaign organisations become ever more vital to its prospects one election day as its national poll numbers continue to flatline. The other big political story of the past two months has been the “Green surge”, with support for the environmentalists soaring, particularly among disaffected younger voters, and pushing the Liberal Democrats into fifth in some polls. This month we have for the first time added estimates for the Greens. Our systematic inspection of the polling evidence does not support the narrative of a “surge” concentrated in the past few months, which seems to be the result of selective analysis of the most favourable polls. Instead, we find that support for the Greens has been steadily increasing for about a year, and – at 6.3% – is now more than double the level recorded at the beginning of 2014. As so often in this turbulent election cycle, the true impact of the Greens’ rise is hard to gauge at present – while there is a sustained and genuine shift towards them, it is concentrated among the segment of the electorate (under 25s) that is least likely to vote, and also most likely to be adversely affected by new voter registration rules. In addition, the Greens’ organisation is relatively weak, and so there remain doubts about whether the party has the capacity to mobilise and turn out its new support base. Despite the conventional wisdom that the Greens are hurting Labour, it is striking that the rise in Green support over the past few months has much more closely mirrored the (continued) decline in Liberal Democrat support. With the four party politics of 2014 now giving way to five or six party politics, it is becoming ever more important to consider May 2015 at the constituency level. We have been working hard on developing our constituency level prediction model over the past couple of months, and we will very shortly unveil our seat level forecasts for the election. These will then be updated regularly along with the polling estimates.